Refractive surgery, mainly laser in situ keratomileusis (LASIK), is widely used to correct refractive errors, mainly myopia. It consists of producing a corneal flap, ablating the underlying corneal stroma using laser energy, and repositioning the flap without suturing it to the underlying stroma. A 58-year-old man presented with blurred vision, pain and photophobia after suffering a minor injury on his right eye from a tree branch. He had had LASIK procedures 13 years ago for both eyes. The eye was congested, there was corneal fluorescein staining, and the corneal flap was partially detached and scrolled up (Fig. 1). 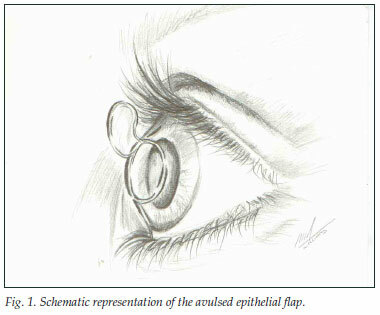 Under local sub-conjunctival anaesthesia the flap was irrigated, cleaned, repositioned and sutured. Methylprednisolone and gentamicin were injected subconjunctivally, and the eye was closed for 24 hours. The following day the eye was quiet with a visual acuity of 6/9 and the subsequent course was uneventful. Traumatic dislocation has been reported after 10 days,3 1 year4 and 3 years and 5 months.5 Our report is the first to indicate the possibility of weak adhesion of the flap after a much longer time, i.e. 13 years. Roland R Berger, MD (Padova), Specialist in Ophthalmology (Tel-Aviv), is Senior Consultant at Tambo Memorial Hospital in Boksburg. His main interest is ophthalmic trauma; Melissa D Williams, MB BCh, is doing her community service at the same hospital; Clive A Novis, MB BCh, FCS (Ophthalmology), is in private practice. His main interests are cataract and refractive surgery.